A deficient application will increase the time it takes to get a license issued. When an application is submitted with mistakes or omissions, it will likely be considered deficient. Common reasons for deficiency letters are the application was incomplete, incorrectly signed, or the form was not current. The most common reason an application is deficient is because it is incomplete. Sometimes this is because questions on the application were left blank, attachments were missing, or some prerequisite requirement was not met. 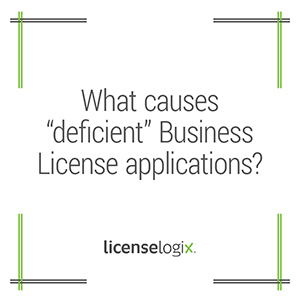 LicenseLogix recommends that all questions are addressed on an application. Even when a question is inapplicable to the individual or entity, it is better to write “N/A” and explain why it does not apply. Make sure to read directions carefully and be familiar with the industry to identify all attachments and supplemental documents. Another common reason an application is deficient is the signature pages are not originals, not notarized properly, not signed by the right people, or not signed at all. Often the reason for these errors is due to unclear instructions. When an original signature is required, meaning the actual pen to paper page is submitted with the application, it is usually not noted in the instructions. Sometimes applicants follow all the steps perfectly, only to have their application deficient because they used an old form. Licensing agencies update and change forms frequently and often without notice. It is possible to start an application and by the time it is filed, the form is stale. Make sure you check with the licensing agency to ensure you have the most up-to-date application form. Save precious time and money by outsourcing all license initial and renewal filings to LicenseLogix. Our services will help your company obtain all licenses and registrations, quickly and correctly! For additional help you can fill in the form on the bottom or give us a call at (800) 292-0909.